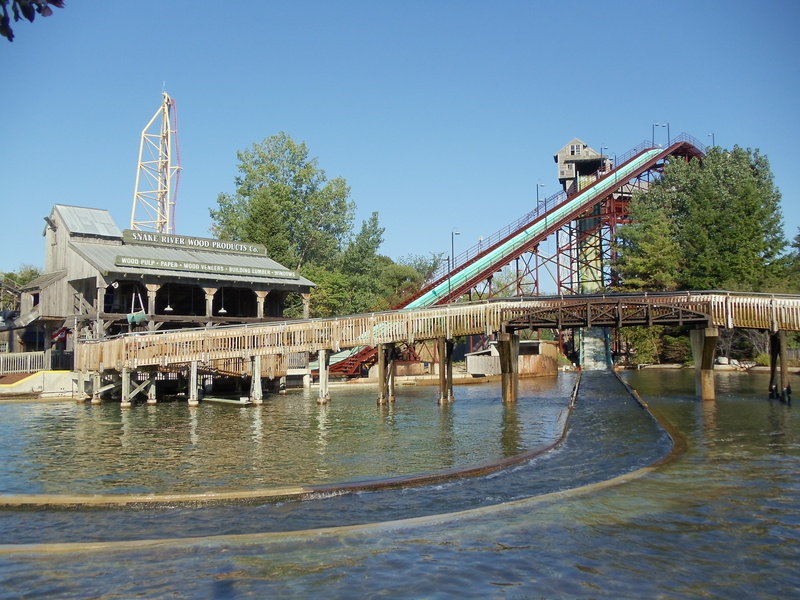 This page is for the flat rides, rides that are not roller coasters, that are at Cedar Point. Unfortunately,I didn’t photograph or film every flat ride at Cedar Point but I did take pictures and shoot video of some of the more popular flat rides. I even have videos of rides that are no longer operating. I hope you enjoy reading this and check back every once in a while to see if I’ve updated anything. 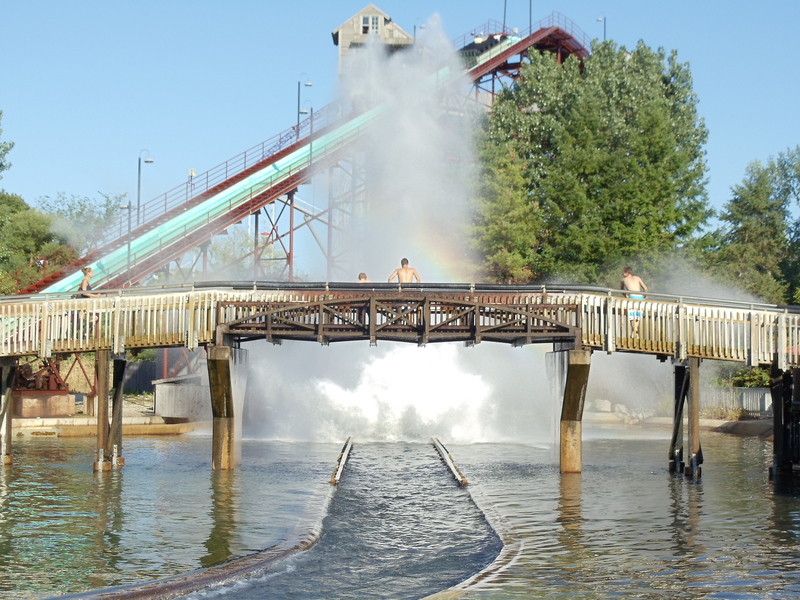 This tour takes riders on a 40 minute tour of Sandusky Bay along the Cedar Point Shoreline. It is an added charge but it’s well worth the money as there are some beautiful shots of the park from the bay. You also ride in one of the original Western Boat Cruise paddlewheel boats. 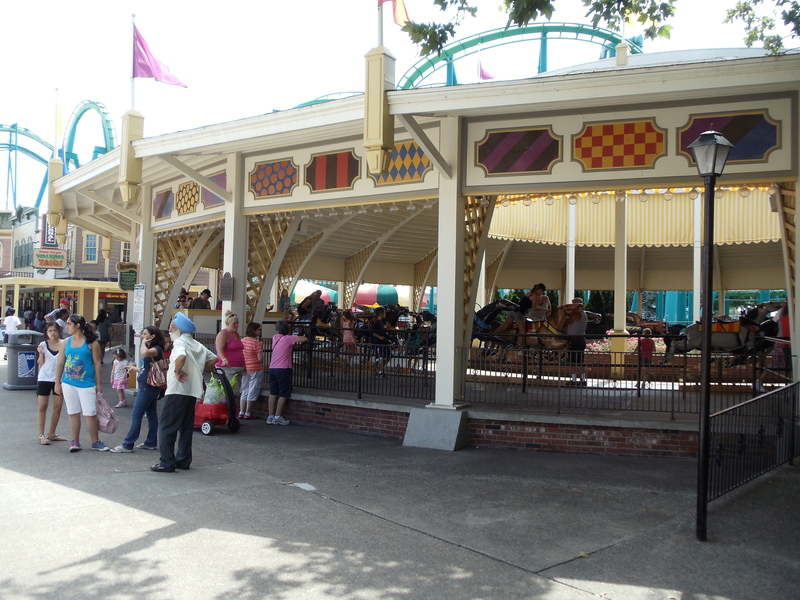 The Midway Carousel is the first attraction you see after going through the gates. It was originally built by DC Muller in 1912 for a park in Revere Beach, MA and it ran there under the name “Hadley’s Hurdlers” until it was moved to Nantasket Beach, MA where it remained there until 1946 when it was moved to Cedar Point where it continues to operate to this day. It has 60 jumping horses, four chariots, and a WurliTzer 153 band organ that’s not operating. The carousel itself is on the National Register of Historic Places and I believe it’s the only operating carousel from DC Muller that’s still in operation. Our next ride is no longer at the park. 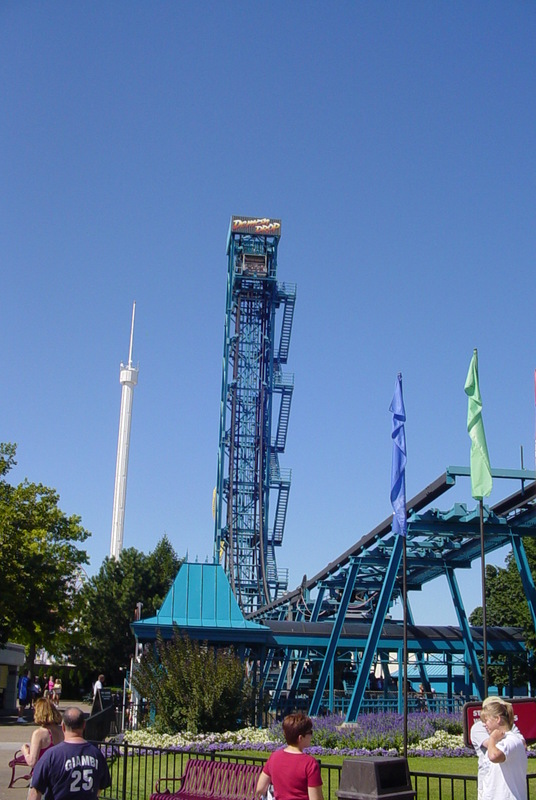 This was a First Generation Freefall ride from Intamin which was installed here in 1983 and operated here until 2009 when it was moved to Dorney Park in Allentown, Pennsylvania. I believe it’s the only operating ride of its kind in North America. At one time, these rides were all over the place. 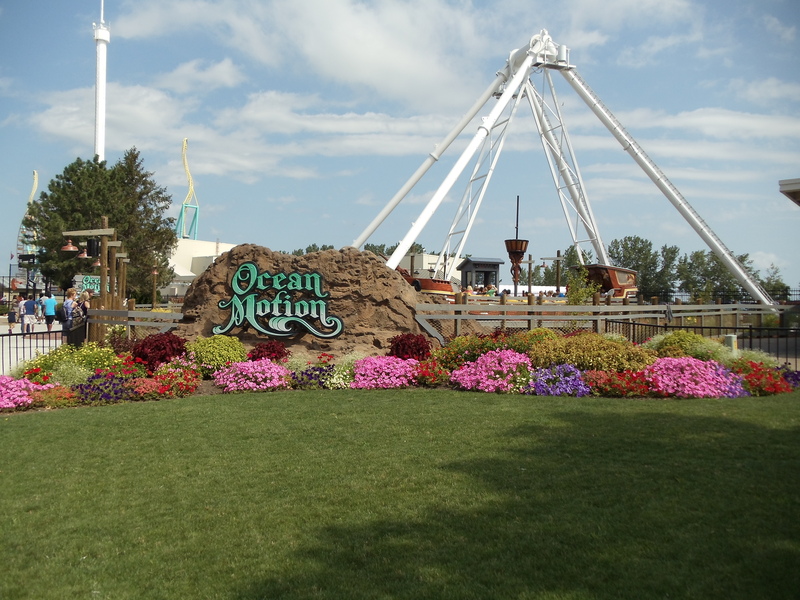 Ocean Motion was installed in its place so the Windseeker could be installed where Ocean Motion once was. This is the attraction that replaced Demon Drop. It’s a swinging pirate ship that does not go upside down that was installed at the park in 1982 and came from the HUSS Park Attractions Company. Ocean Motion swings riders back and forth to a height of 65 feet. Next, we’ll take a right onto the Wicked Twister Midway and head to five rides. This a Gyro observation tower that was built by Willie Buehler’s Space Tower Company with the passenger cabin from the Von Roll company in 1965. The tower itself is 330 ft/100m tall but the passenger cabin rises to the 285 ft level. 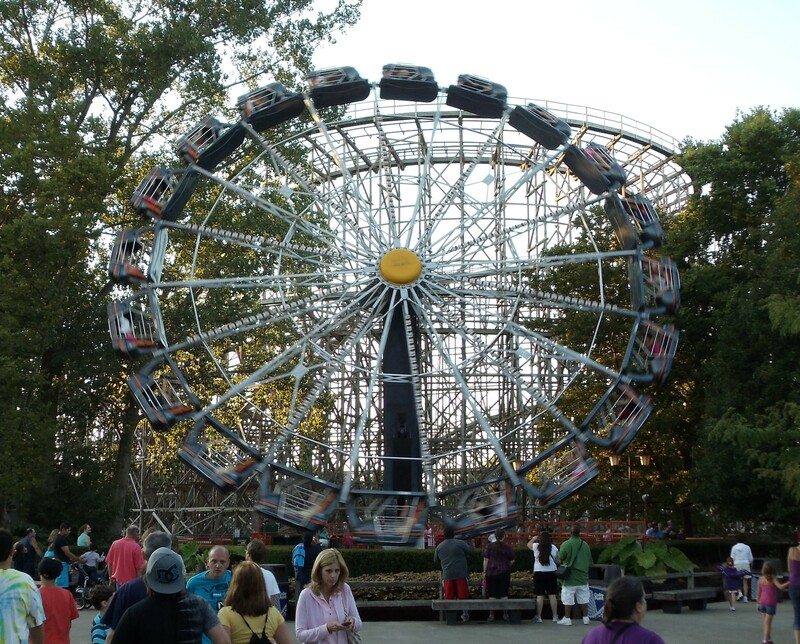 This ride holds the distinction of being the first amusement ride in the world to top the 300 ft mark. 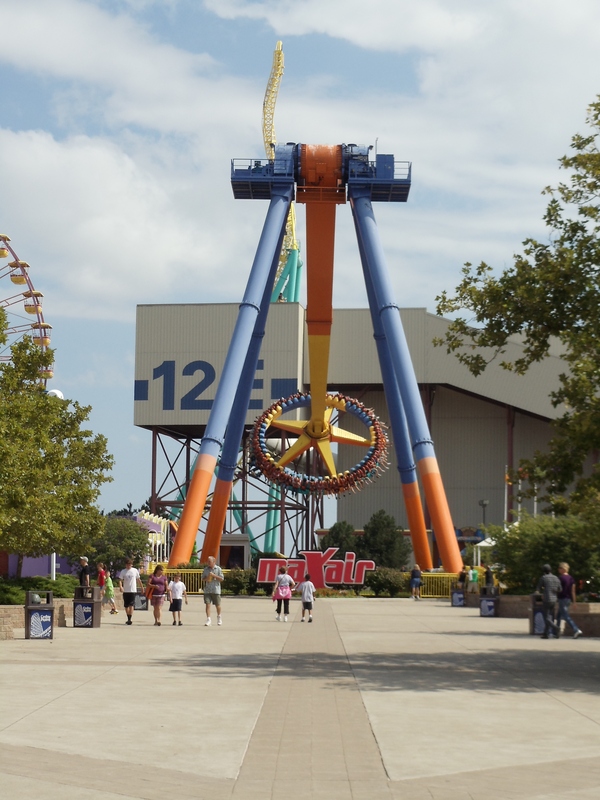 This ride closed on August 14, 2012 and was demolished using explosives that were placed in strategic locations at the base of the tower to allow it to fall over on the beach and the area that was occupied by the Disaster Transport roller coaster. 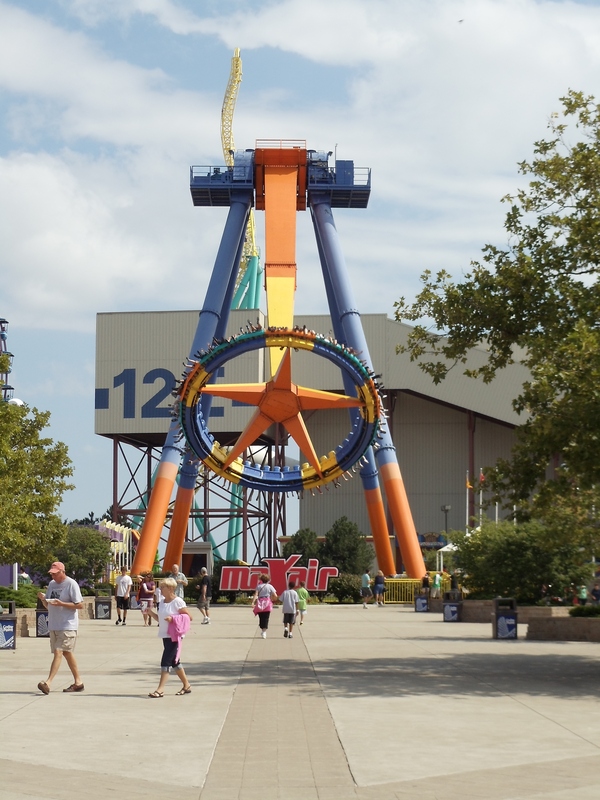 This ride along with the Disaster Transport bobsled coaster (in the building with the “12E” on it) was removed in order to make way for Gatekeeper which is the longest, tallest, and fastest Winged coaster from B&M. Here’s is a wonderful tribute video someone made that chronicles its history. This is a Giant Frisbee model from HUSS Mfg. 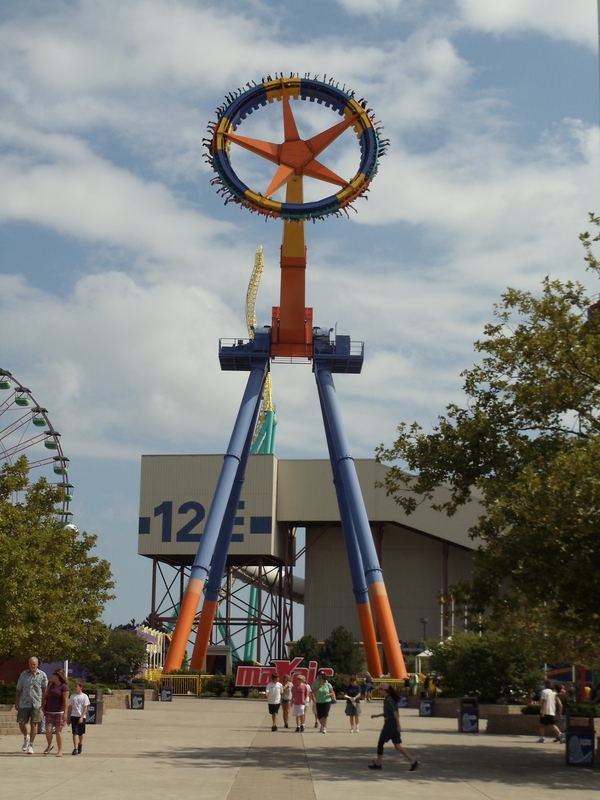 This ride was installed in 2006 and it swings back and forth until it reaches its maximum height while slowly spinning the seating area at the bottom. Behind maXair is our next ride. 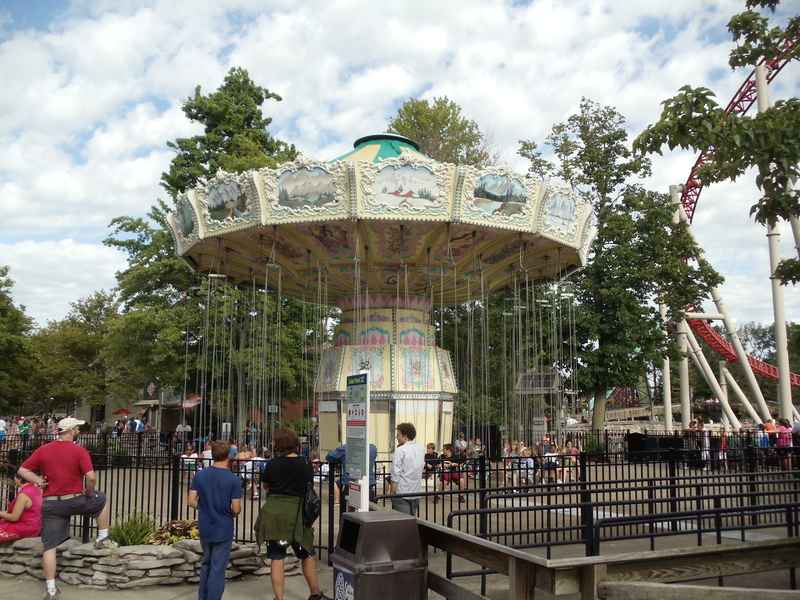 Troika is a ride from HUSS Mfg that was installed here in 1976 and reaches a height of about 25 feet. Next on the list is the Giant Wheel. This aptly named ride is from Anton Schwarzkopf and has been at the park since 1972 though this isn’t its original location. 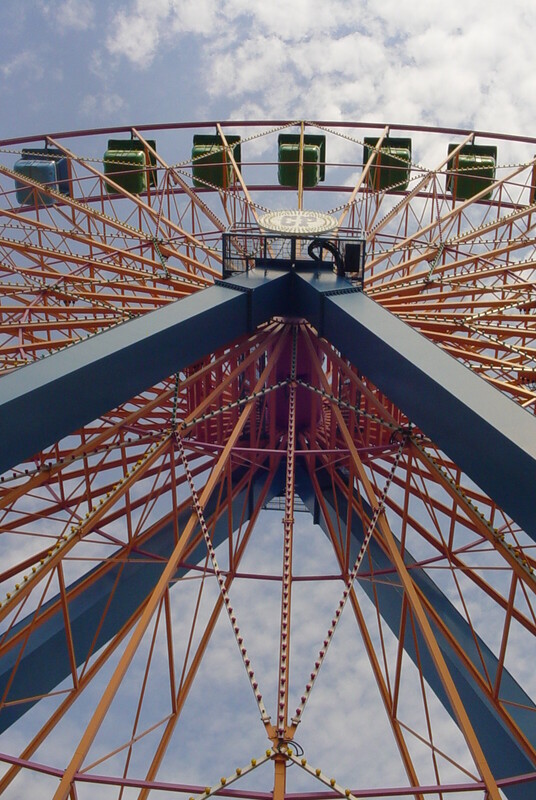 This wheel, which stands at 136 feet tall, used to be where Millennium Force stands now. On our way back to the main midway is out next ride. The rides name is spelled with two R’s in carousel so I didn’t misspell it. It was built in 1921 by William H Dentzel for another park which is currently not known. 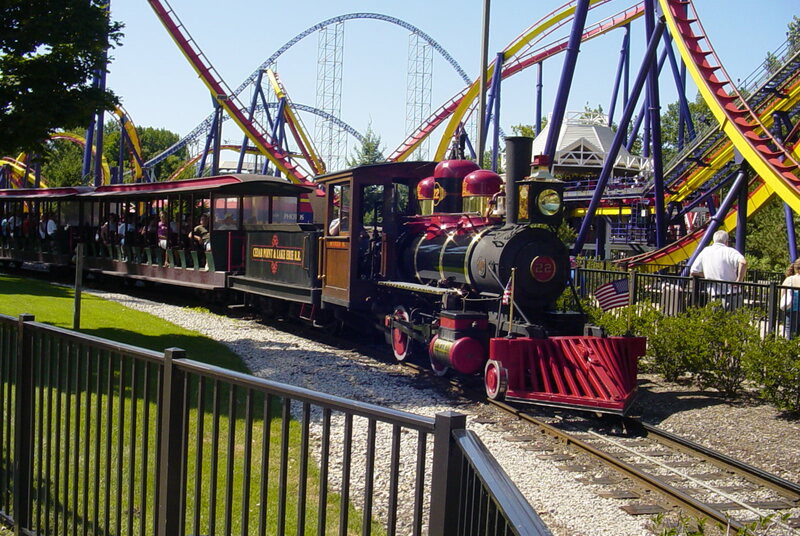 It was then moved to the Huntington Park/Germantown area of Philadelphia, PA where it remained until being moved to Cedar Point in 1968 where it operates to this day. 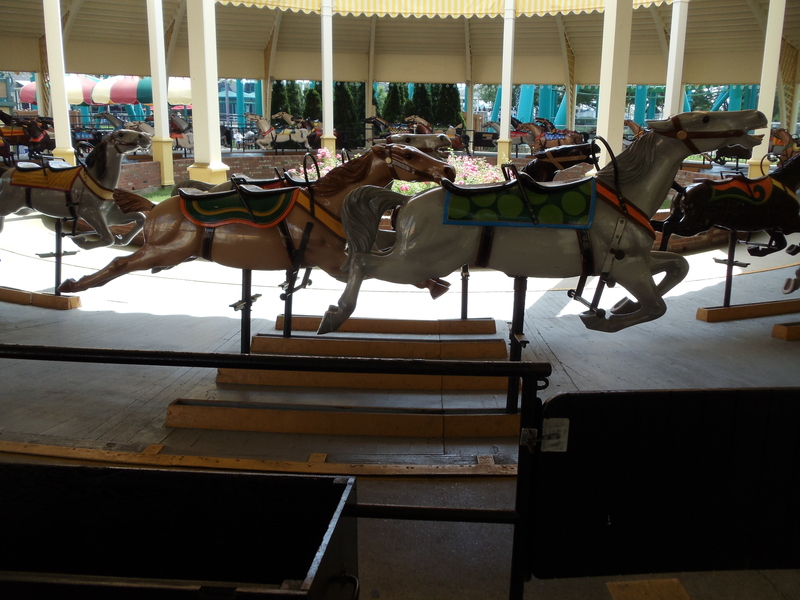 This Carousel has three rows of which the inner and middle rows jump and the outer row are standers. This carousel has a menagerie of animals which means there are other animals mixed in with the horses and chariots. The menagerie includes 27 jumping horses, 11 standing horses, 2 Bears, 1 lion, 1 mule, 2 ostriches, 4 rabbits, 1 tiger, and 2 chariots. It should be noted that Daniel Muller was commissioned to add ornamentation and decorative elements to the horses and other figures. 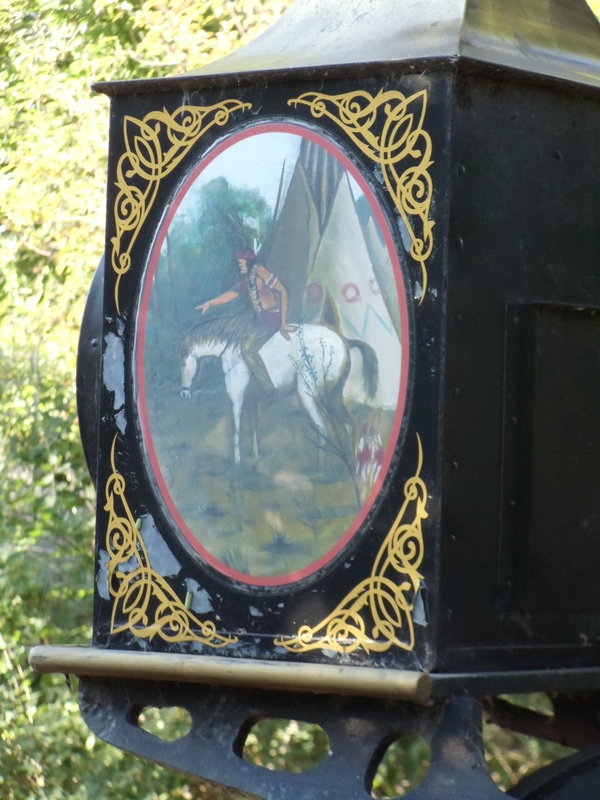 This carousel may also have a Stinson organ with a WurliTzer façade but it’s not known for shure what it is. Thanks go to the National Carousel Association for the information on this carousel. Now we’ll walk back to the Million Dollar Midway for our next two rides. This ride is was from the Von Roll Company in Bern, Switzerland and is a Type 101 park model. It was installed here in 1962 and takes riders over the Million Dollar Midway at a height of 92 feet to the center of the park near the Iron Dragon and Corkscrew roller coasters and Coasters Café. 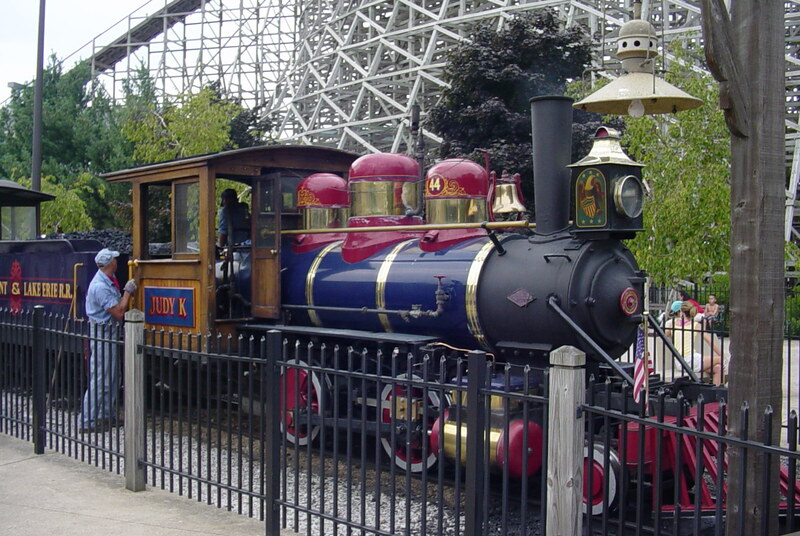 This ride is one of the oldest rides at Cedar Point and the oldest operating Von Roll Type 101 in existence. While we’re on the Skyride, we see our next ride off to the right. So we’ll walk back to the that ride once we exit the Skyride. Cedar Downs is basically a carousel on steroids as it is much bigger and faster. This is a very rare ride as there are only three still operating in the world. The other two are at Playland Park in Rye, New York and at Blackpool Pleasure Beach in Blackpool, England. 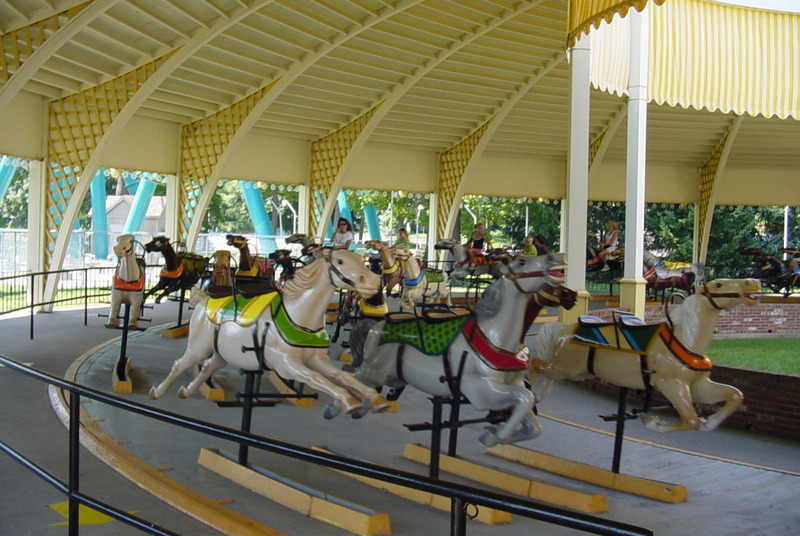 This particular ride was built by the Church & Prior Co and installed in 1921 at Euclid Beach Park near Cleveland, Ohio where it ran under the name of the Great American Racing Derby. It remained there until the park closed in September of 1969. 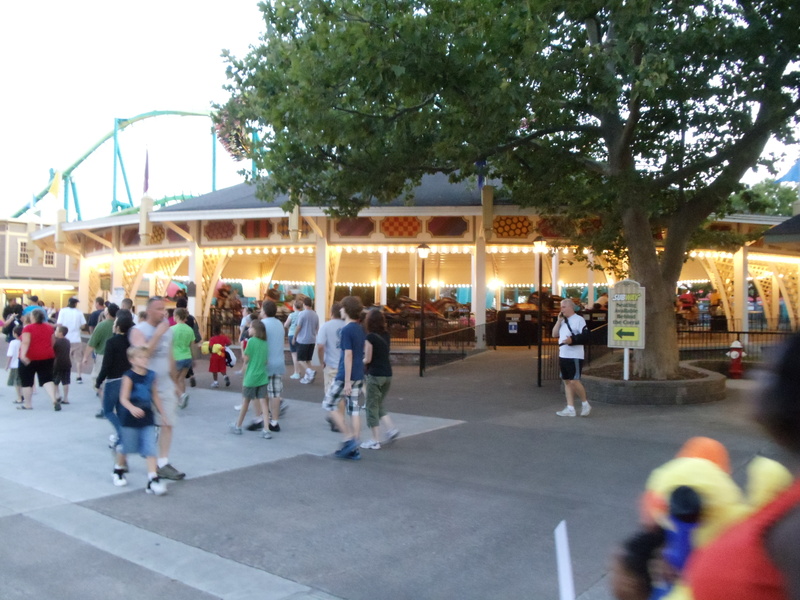 Cedar Point then bought it and moved it to its present location where it has been operating ever since. These horses do move up & down but only slightly, they also move forward and backward to make you feel like you’re really in a high stakes derby race. Now we’re walking back towards the other Skyride station but something tall catches our eyes off to the right. This is the first Windseeker model from Mondial and it’s 301 feet tall. 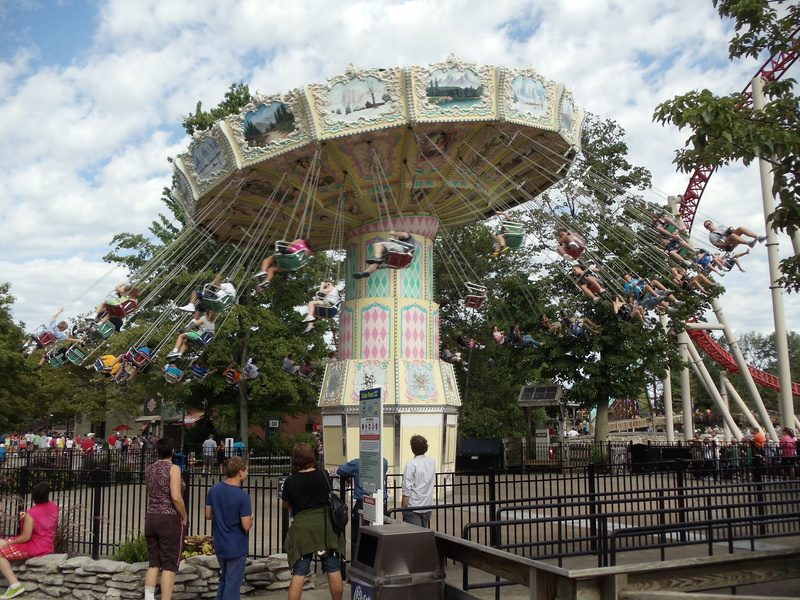 It sits right on the shores of Lake Erie, one of the five (six in the US) Great Lakes so it really offers a great view of the lake and the park while listening to music from the rides on board speakers that evoke a soaring type of feeling. Music from ET, Superman, Star Trek, Jupiter from Modest Mussorgsky’s “The Planets” and others have been heard from the ride. Now we’re at a fork in the road where we can turn right and go down the Dragster Midway or turn left and go down the Iron Dragon Midway. 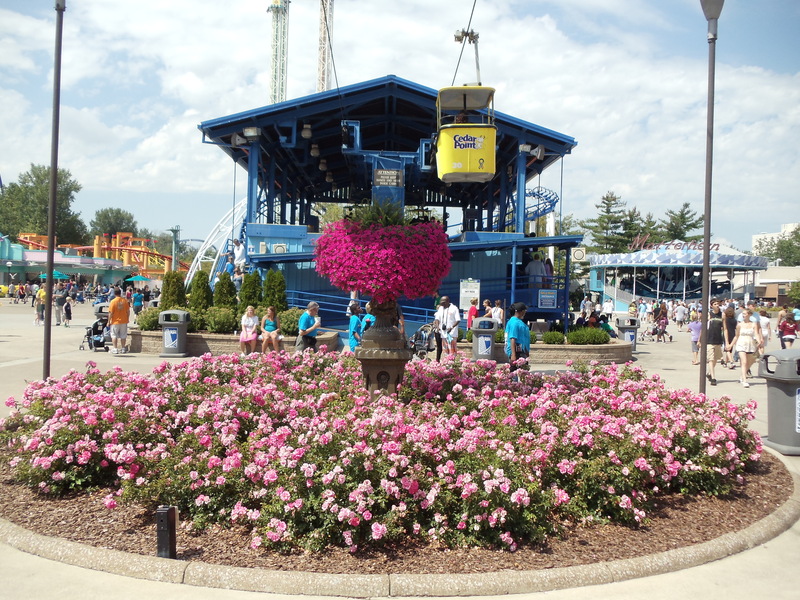 The coin has been flipped and we will go right and our first attraction is the Power Tower. The Power Tower was built by S&S Worldwide in 1998 and 240 feet tall. 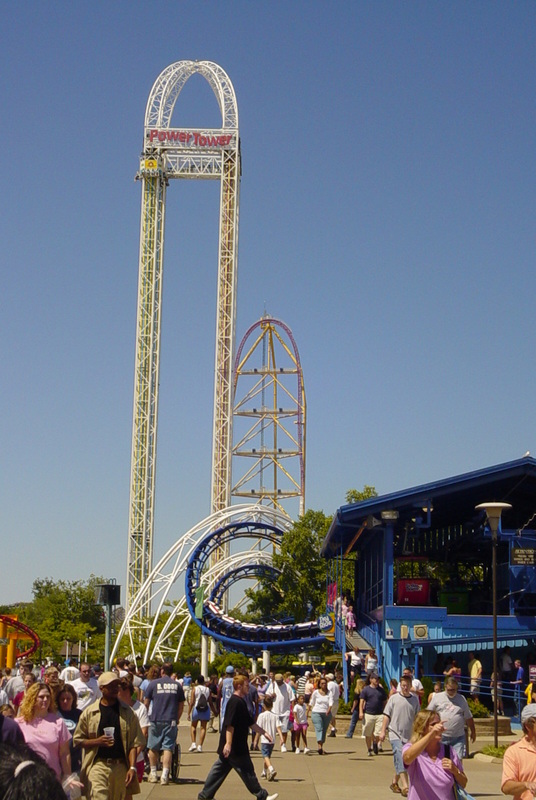 It is the only tower complex in the world that has two Turbo Drop rides and two Space Shot rides. 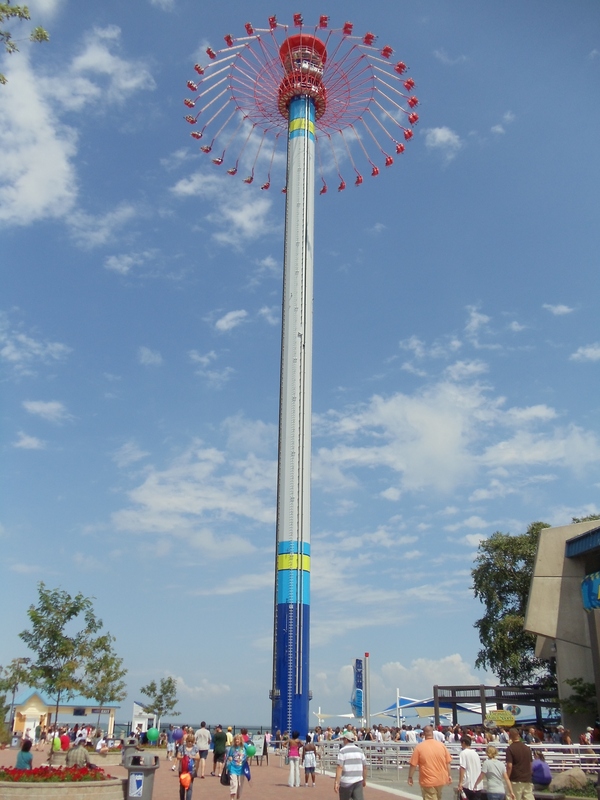 You can choose to be lifted to the top on one of the two Turbo Drop towers and be dropped 240 feet to the ground, or you can board one of the two Space Shot towers and be launched 240 feet to the top. The two red sides are the Space Shot towers and the two aqua sides are the Turbo Drop towers. The video below contains off ride views of both experiences. 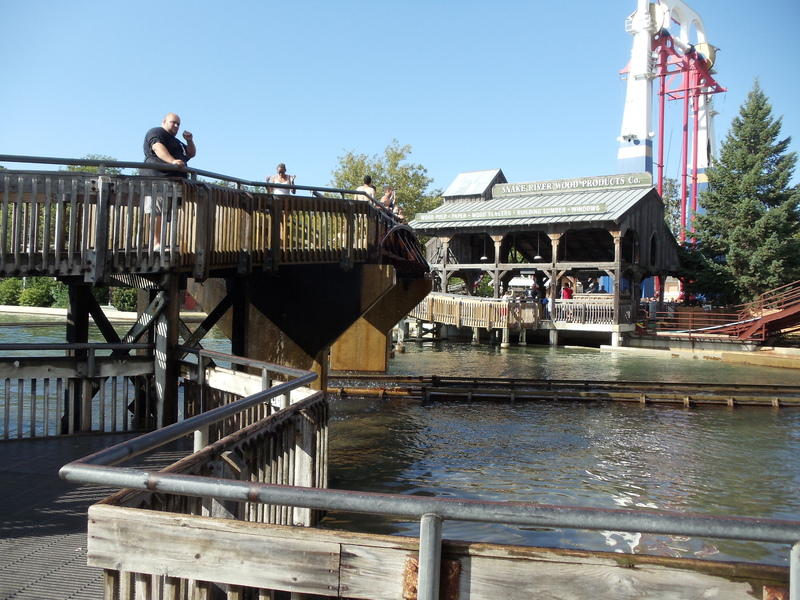 Next up is a ride that is no longer in operation called the Paddlewheel Excursion. This ride operated here from 1964 to 2011 when it was replaced by Dinosaurs Alive, a up charge (extra pay) walk-through attraction that has life-sized animatronic dinosaurs. This ride was a nice, relaxing way to rest your tired feet and legs and be mildly entertained at the same time. 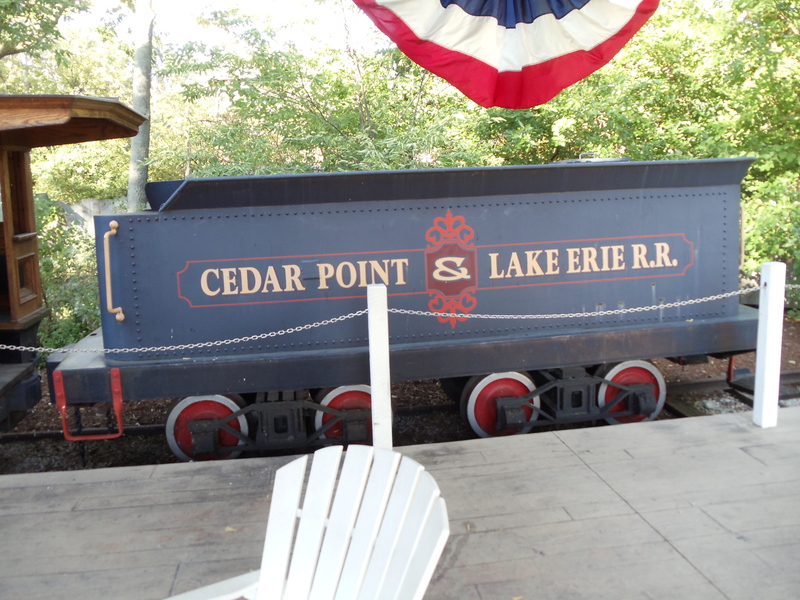 I think it was a real shame that the ride was removed as it was one of Cedar Point’s oldest operating rides. 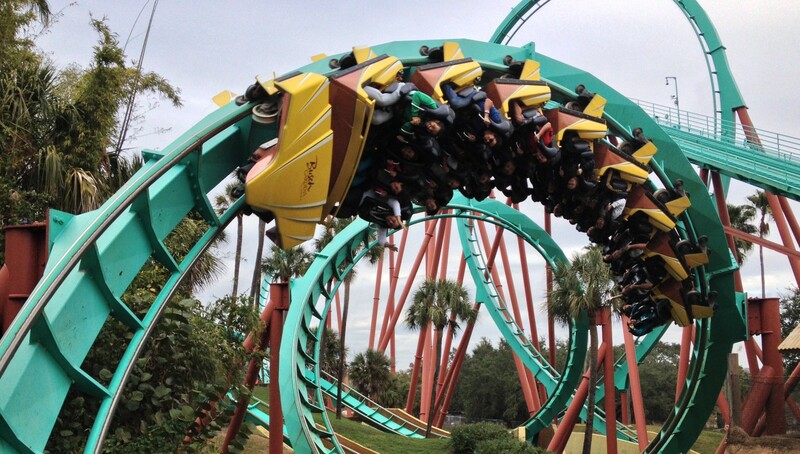 This ride is from HUSS Park Attractions and is a very popular ride. It was installed here in 1977 and has been thrilling guests ever since. 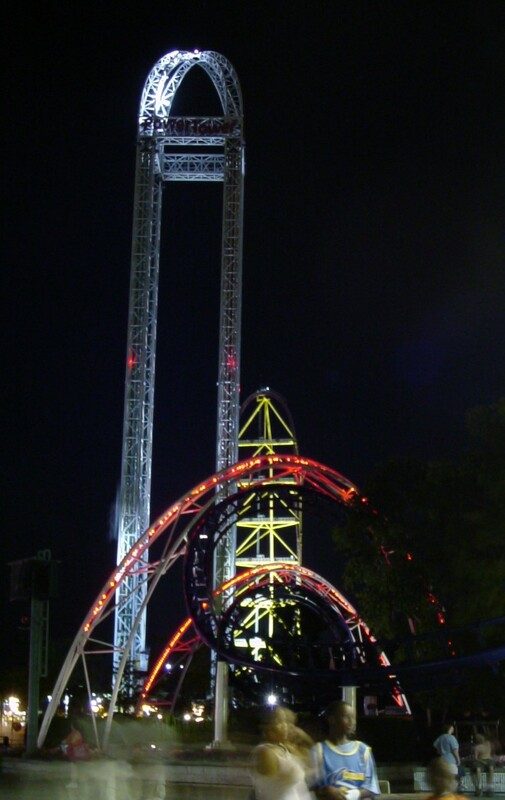 The ride reaches a height of 60 feet once the ride is fully extended. The next ride is a classic. This ride is a classic swing ride from Zierer and it was built in 1979. Riders are secured to a chair that’s suspended from the top by chains. The chairs rise and begin to swing reaching a height of about 16 feet. Next is a extreme swing ride. This is a Screamin’ Swing ride from S&S Worldwide and it was installed here in 2006. 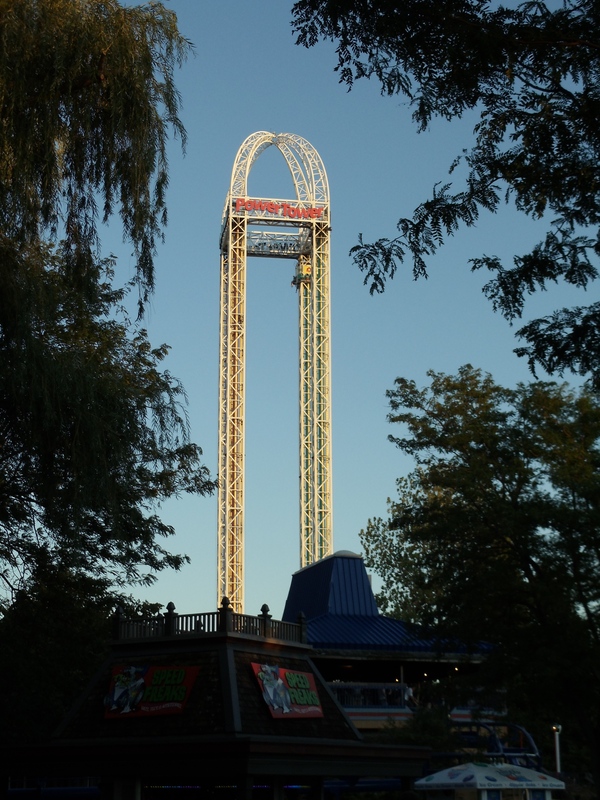 It’s currently the worlds tallest Screamin’ Swing ride standing at 103 feet tall and swings riders 125 feet high with a maximum swing of 120 degrees at a maximum speed of 60 mph. The next ride will leave you absolutely soaked from head to toe. This is a Shoot-the-Chute ride from Arrow Dynamics. It opened here in 1993 and was the worlds tallest at 80 feet, fastest at 40 mph, and steepest water ride. This ride is loosely themed to wood packing factory which is at the top of the lift hill. 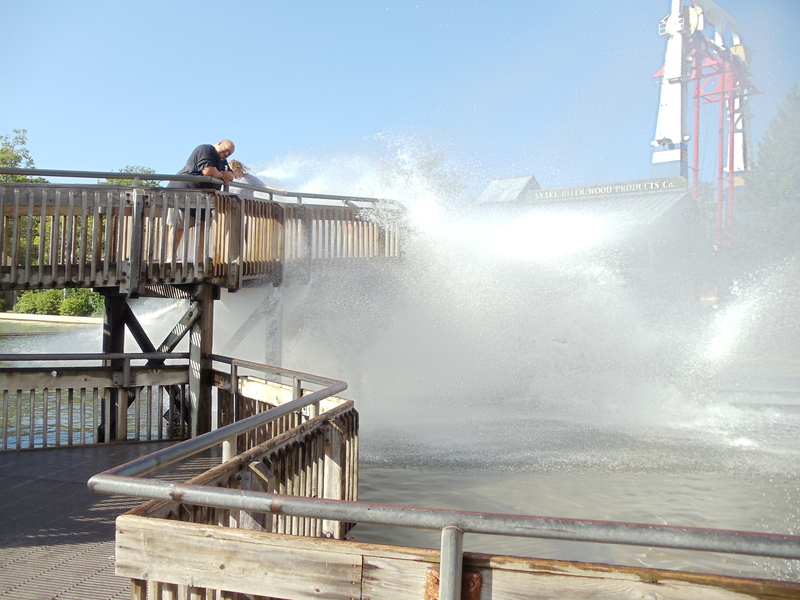 The splashdown creates a huge splash that soaks the exiting riders on the bridge. 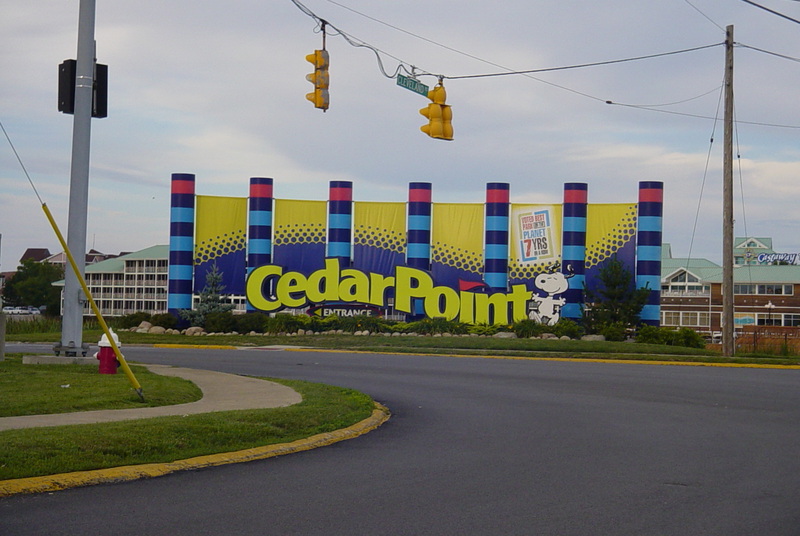 Last is one of Cedar Point’s oldest attractions. 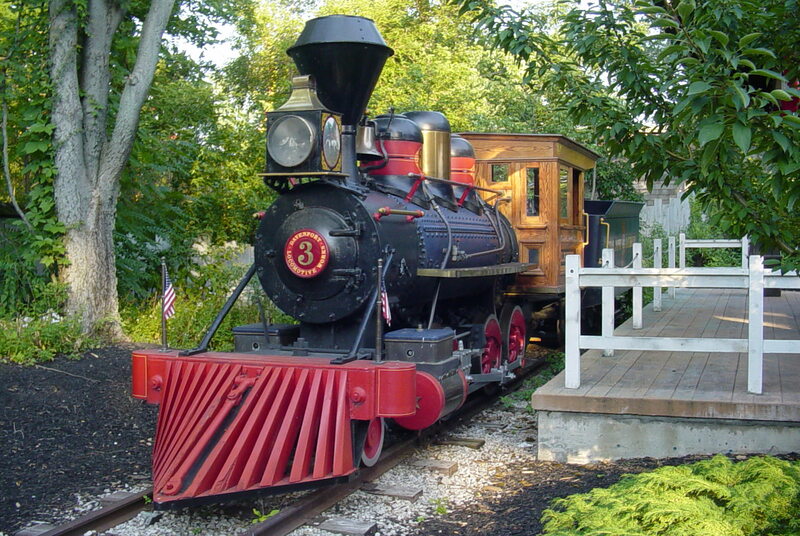 This was originally built in 1963 using original steam locomotives rescued and restored from various businesses. 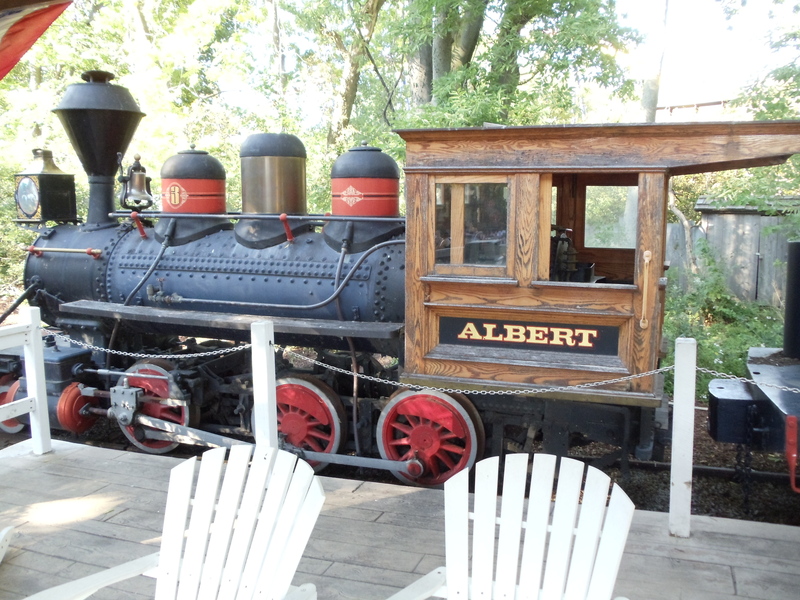 One of the original locomotives (Albert) is still at the park on permanent display in the photos below. 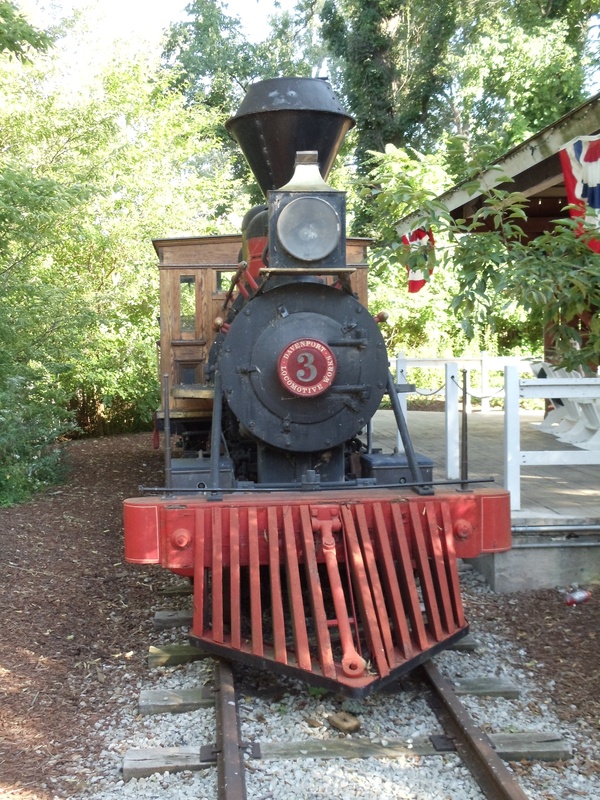 The photos below are of one of the operating trains. 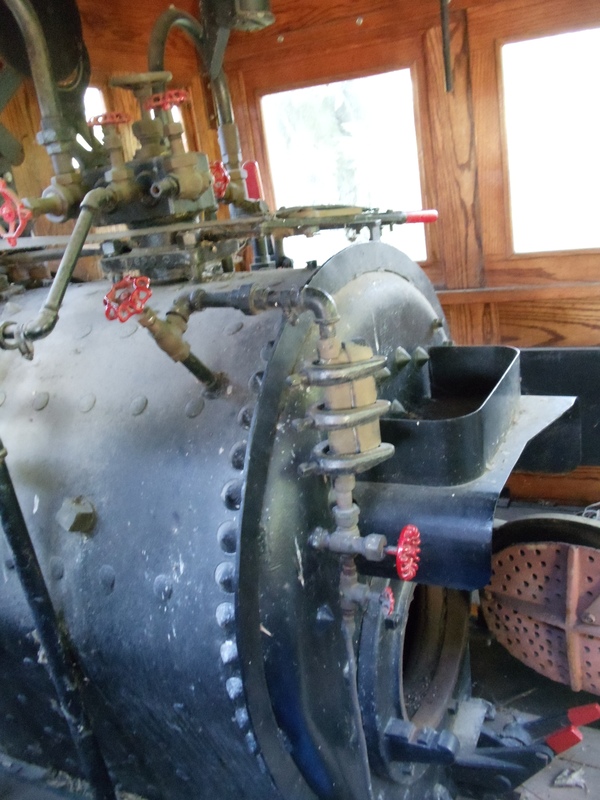 All three of their trains either burn coal or wood to operate the steam locomotives and operate a 2-4-0 wheel arrangement on a 36 inch narrow gauge track. The wheel arrangement refers to how the wheels are set, a 2-4-0 engine means there are two guide wheels in front, four large drive wheels in the middle, and no trailing wheels under the engineers cab. The gauge of the track is the distance between the two rails on the track. This ride is about a fifteen minute ride with two stations, one on the Millennium Force Midway and the other in the Western area. 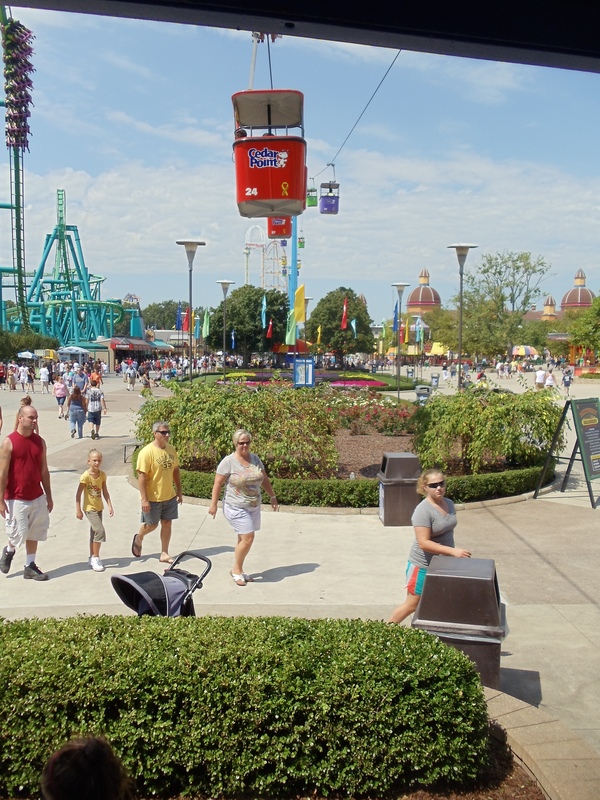 The ride is a two-mile track in which will take you by Sandusky Bay as well as some of Cedar Points rides and roller coasters. You’ll also pass through Bone Town, a western town that is inhabited by moving skeletons. You can stay on the train if you want to make a round trip, or just want to rest your tired feet. I hope you’ve enjoyed this review and please check back occasionally to see if I’ve updated this post. Fantastic! I am so proud! This is an outstanding page. 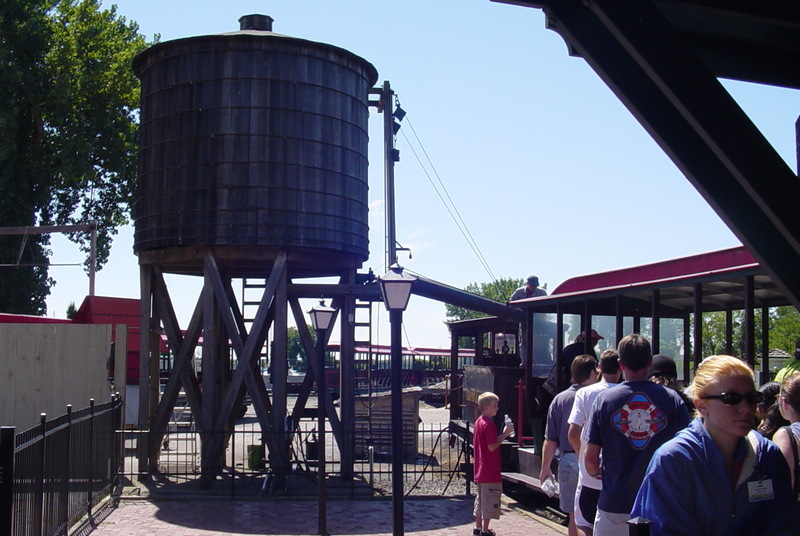 Great nods to the history of the park, and you’ve really got a jewel with the on-ride of Paddlewheel Excursion. It was the epitome of a family ride. Young and Old could enjoy the cruise together. The corny jokes entertained the adults who listened to the dialogue, and the young-uns could experience some great views of the rides they could ride “when you eat your vegetables and get a little bit taller.” Very well done.